Rong Shu Xia Bak Kut Teh 榕树下肉骨茶 – A Taste of Malaysia in Singapore! 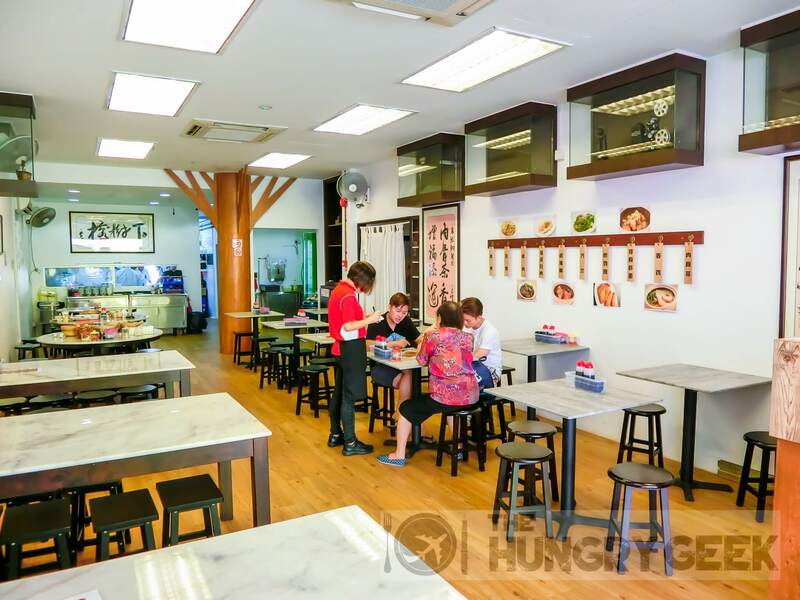 Rong Shu Xia Bak Kut Teh 榕树下肉骨茶 is a nice air-conditioned Malaysian bak kut teh restaurant at the cosy little spot along Tai Thong Crescent. My first thought was – YES! – we can finally try Malaysian-style bak kut teh in Singapore. My next thought – what is an air-conditioned restaurant doing in Tai Thong Crescent? There are some foodie areas in Singapore like Tai Thong Crescent, where it is relatively inaccessible unless you have a car – these places are generally low-cost budget hawkers. People only drive out of their way if they can get super delicious food at ridiculously cheap prices. The owner is taking some risk by setting up a concept like this over here, but this is really a boon for the office workers and residents that live nearby. This place sells top quality Chinese restaurant food at super budget prices. 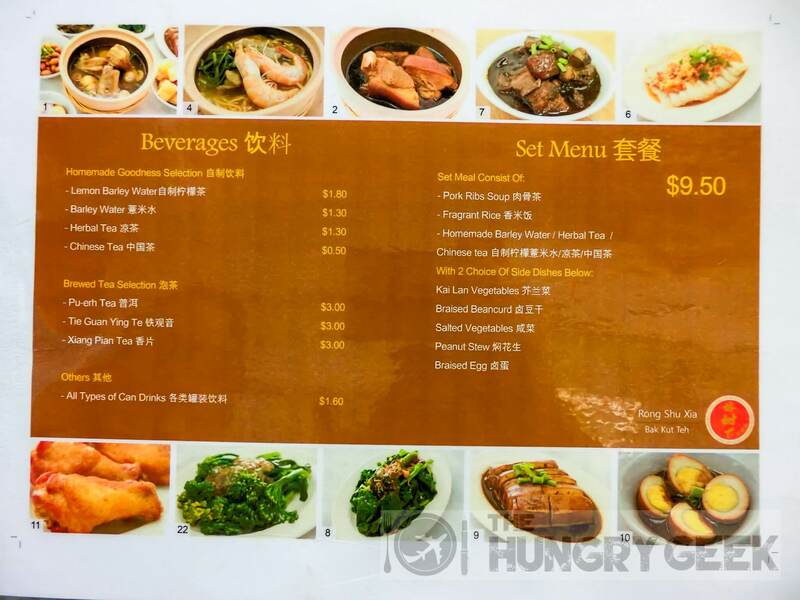 Their Malaysian Bak Kut Teh goes for S$5.90 and their Spare Ribs Prawn Noodles goes for S$5.50. That is really cheap when you consider the air-con and service. You won’t pay less at your average food court these days. This visit was an invitation, and we were fortunate enough to try their super delicious Fried Laksa and the Fiery Pork dish which is not on the menu yet. It may be budget prices but they also have this brilliant chef Mr Wong, who I think is really more suitable to be helming a high-end Chinese restaurant. He has a vast amount of experience with plenty of culinary skill in him, judging by the way he passionately talks about the recipes of his signature items. 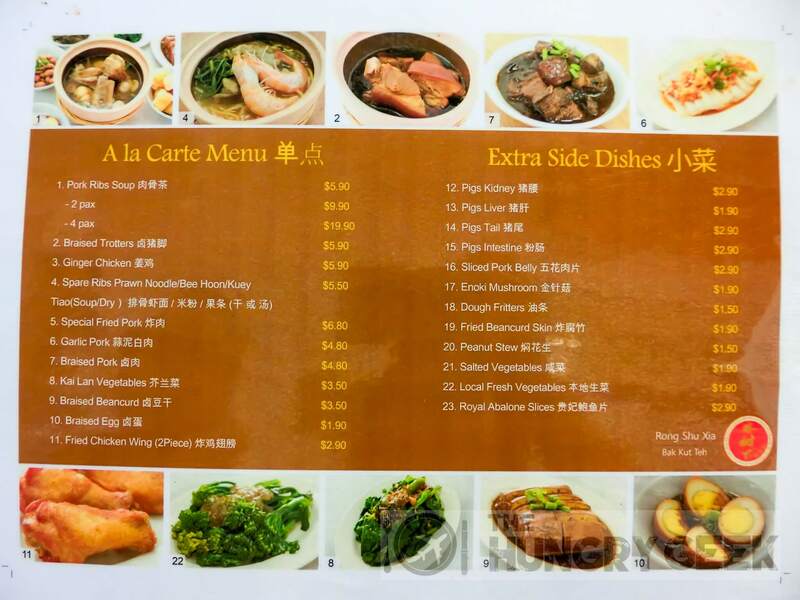 This is a very clean and concise menu, and the service is the usual Chinese eatery standard. You can expect a crowd during lunch on weekdays with all the office workers around, but it is a bit quieter on weekends. There is ample parking in the area as well. This is not your usual prawn noodles. The chef stir fries the noodles in XO sauce before placing them in the delicious broth. This additional step prevents the noodles from becoming soggy or overcooked when left in the soup for too long. The soup is fragrant and delicious, and there is a generous amount of ingredients with some large prawns and an ample amount of spare ribs. We were pretty happy with this and we rate it 4/5. This is priced at a super value S$5.50. Rong Shu Xia’s owner is a big fan of the 顺发肉骨茶 (shùn fā ròu gǔ chá) bak kut teh chain in Malaysia, and he decided to bring it to Singapore. As of the date of this article, we do not know of any similar Malaysian-style bak kut teh in Singapore. It is a little different from the bak kut teh from Port Klang and Singapore, with the clear non-peppery herbal broth. As you can imagine we were pretty impressed with the famous Soon Futt Bak Kut Teh in Kulai, and this bak kut teh at Rong Shu Xia had a very strong resemblance. There are some noticeable differences, with a greater emphasis on the broth here at Rong Shu Xia, as opposed to a mishmash of ingredients with Soon Futt. We think that the original brew at Soon Futt has the upper hand, but nonetheless we were pretty impressed with the bak kut teh here at Rong Shu Xia. The mercurial Chef Wong did not disappoint, and he produced bak kut teh with the perfect tenderness. Unlike most other bak kut teh stalls that simply leave the ribs in the broth to stew until its sold out, Chef Wong removes the ribs from the broth when the meat reaches the perfect tenderness. They are placed in a warmer until there’s an order and the result is perfectly tender bak kut teh no matter when you order it. We give the bak kut teh here a cool 4/5. You can get it at a bargain S$5.90 for a single portion, S$9.90 for a double portion or S$19.90 for a party of four. The huge and delicious pot of bak kut teh! This was our favourite dish of the meal. The dish is pretty self explanatory. The laksa taste is superbly infused with the noodles, and there are just so many large prawns here. The noodles were done al dente, with just the perfect amount of moisture for a stir fried dish. Your first mouthful of these laksa noodles is really super shiok. If you are a fan of laksa you must try this ‘dry’ stir-fried incarnation of the dish. We rate this magnificent super delicious dish 4.2/5. You can get it at S$5.90. The most incredible part of this establishment is Chef Wong. He is an experienced master chef with the Chinese cuisine, and from our conversation with him, we can tell that he really knows his stuff. The tricks of each dish, strengths and weaknesses, he knows them all. Ideally he would be at the helm of a busy Chinese restaurant, but I guess he makes the best of his location. The dishes that we tried at Rong Shu Xia were masterfully done, but for someone as versatile as Chef Wong, he may be the jack of all trades. It is difficult to break the super delicious barrier without years of specialising in a single dish. The hawker scene in Singapore is just that tough. That said, we are sure that given enough time, he will make the food at Rong Shu Xia amazingly delicious. If you are in the Potong Pasir area for work or play, do drop by Rong Shu Xia for a taste of the fare. You get nice aircon and pretty amazing prices for the standard of the food. ← Singapore Michelin Guide 2016 – Best Food in Singapore? Mok Gao Beef Noodles 莫九 – Kulai’s Most Famous In "Malaysia Hawker Food"
Soon Futt Bak Kut Teh 顺发肉骨茶 – Kulai Herbal Taste In "Malaysia Restaurants"